Eggs are so versatile – to the point that you can always make something out of them when you’re in a pinch. But, the chance that it’ll still be something boring and typical is fairly high. Speaking of which, I was no different than you guys; and that was my motive when bringing up this egg curry recipe. Luna’s here today with the intention to soothe your taste buds after days in and out with instant foods. Originating from both Northern and Southern India, Egg Curry is a beginner-level dish that serves both your delicious and easy requirements. As comprehensible as the name could be, Egg Curry is tailored by merging boiled eggs and curry into one single platter. Guess how flavor-packed it is? The soft yet chewy texture of the egg is just amusing; not to mention how the tomato-yogurt-based gravy makes the whole thing so moderately spicy in taste, but unexpectedly creamy at the same time. Yogurt or coconut paste? Milk or heavy cream? Truth-teller here: Yogurt helps big time on the dreamy creaminess of the curry. As sour and tangy as it is, yogurt makes a lovely choice when paired with tomatoes. They form a captivating combination that’s so rich in taste to chase your taste buds. Apart from the basics above, coconut paste or non-sweetened milk is the next go-to option when a lighter, thinner curry with less fat is in demand. In contrast, substituting yogurt with heavy cream will double up the sweetness, hence providing you with a creamier and thicker curry, rather than the traditionally tangy flavor. 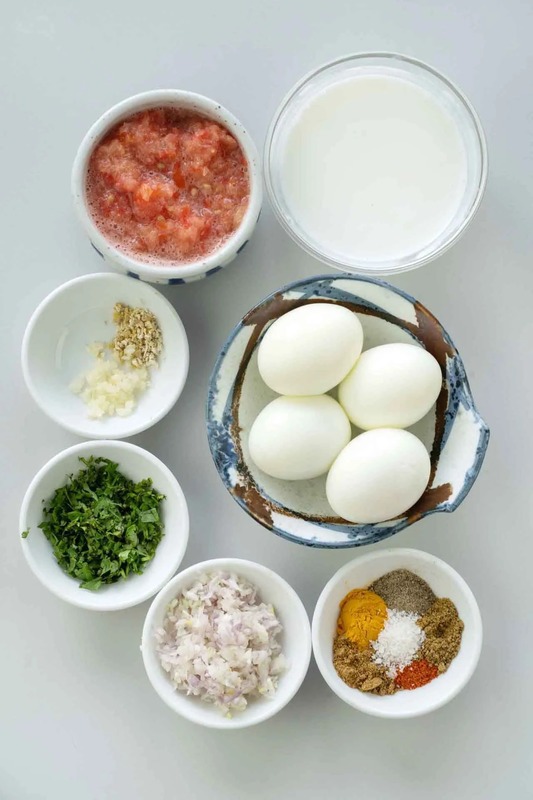 Most of the time, the authentic Indian egg curry is made with hard-boiled eggs. For a sake of a sated meal, there’s hardly any other way to have egg curry with more perfection than using hard-boiled eggs. I don’t think you guys would ever prefer a slushy egg yolks blended together with the gravy where you could barely have a proper bite of anything. Plus, keeping the hard-boiled eggs edible within one week is a cinch – you only have to store them in the fridge, they’re safe either with or without shell. Although, I personally believe you will just use them up in no more than 3 days. I was so thrilled I have to give this egg curry a go, mostly because its spiciness is so easily adjusted. All I have to do is to work on the amount of black pepper and red pepper. The ingredients are so basic that they’ll be just be a cakewalk to you, even if Indian cuisine isn’t your strong suit. That was the taste, now let’s inch it up a bit to the color. Oh dear, Indian dishes always scream the height of excellent conspicuousness. If you dig around the most favorable Indian spices long enough, you’ll find a certain amount of natural coloring agents. For instance, let’s take Kashmiri red chili powder if you desire a true vibrant look. If anything with carb is your first thought of a side dish, then, smack-dab! I mean, what else should it be? If all of the above appear a bit too excessive and you want to halve the calories, I suggest you go super basic with cauliflower rice. Extra fiber and carbs no more! This egg curry recipe provides that exact old-school intoxicating savoriness. Two most basic and well-known delicacies now come together for a simple aromatic entrée – you know, that “have I done something wrong" kind of simple. Stir-fry onion in oil over medium heat on a saucepan until fragrant. Add ginger, garlic, crushed black pepper, cumin seed powder, turmeric and red pepper powder to the pan, stir them together for a couple of minutes. Add crushed tomatoes, coriander powder, and a couple pinches of salt to the pan. Fry until well combined. Add yogurt to the mixture, one tablespoon after another, stir continuously every time a tablespoon is added so the yogurt won't separate into curds or lumps. Repeat until finished. Turn the heat on medium-high, let them cook for half an hour and stir occasionally, until the gravy is thickened. Depending on the consistency of the gravy, add a reasonable amount of water to thin it out if needed. Reduce heat to low and let simmer for another 20 minutes. Remove the saucepan from heat and add the boiled eggs to gravy. Serve the egg curry hot on a bed of steamed rice, garnish with chopped cilantro if desired.